Wednesday of Pittsburgh Vintage Grand Prix week is packed full of activities for Fiat Club of America members, Cortile Car Show participants and the entire #PVGP. 02:00PM - 6:00PM - Free time! Check out the tourist attractions below! A block 25 rooms for Wednesday night at Doubletree, Monroeville, PA. This room block is for those Club Members who want to go to the Downtown Parade, Car Shows and/or the evening PVGP Tune-Up Party on the bridge. There is no Club Dinner Wednesday evening so members are free to explore Pittsburgh. The Pittsburgh Vintage Grand Prix hosts a parade and 4 distinct car displays in downtown Pittsburgh. The parade starts at Station Square, where cars will stage in the parking lot next to the Gateway Clipper – look for signs. Please email Rich Spring if you would like to be in the parade. You don’t have to participate in the parade, you are permitted to go directly to your assigned car display location. at 10:45 am. Market Square - Renovated, refreshed, reinvigorated with more life than ever before! Historic Market Square is once again the hub of Downtown activity. During weekday lunchtimes, office workers and Downtown students fill the Square. It's an eclectic mix of old and new, from the Oyster House, which opened in 1871, to restaurants and watering holes. Fort Pitt Museum & Blockhouse - The Fort Pitt Block House was constructed in 1764 as a way to reinforce the defense of Fort Pitt. Point State Park - It's located at the confluence of three rivers, is at the tip of Pittsburgh’s “Golden Triangle.” The park commemorates and preserves the strategic and historic heritage of the area during the French and Indian War (1754 - 1763). 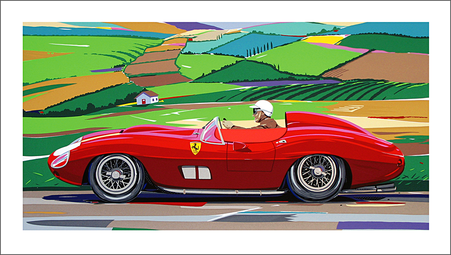 "Scaglietti Cars - Art in Motion" by Randy Owens Original serigraph, edition of 40. Image size 19 x 8, plus margins. Signed by Randy Owens. (2010) $45. Don't want to head back to the hotel just yet and want to stay downtown until the Tune-Up Party? Here's some things you can do and see! Molly's Trolleys - a trolley transportation company that specializes in sightseeing tours. The vehicles are elegant and charming and reminiscent of 1920's-style trolleys. They feature air conditioning and heat, panoramic windows. Segway in Paradise Ready to experience the future of mobility? Join us today for a tour of Pittsburgh! Experience the wonder of this future advancement of transportation. They offer multiple tours and routes. Golden Triangle Bike Rental - Check out the Pittsburgh Winery Bike Tour held each Wednesday. It's an Easy, 7-9 mile tour that takes 2.5-3 hours. It starts at 5pm so you would miss the beginning of the Tune Up Party though. This is an exclusive party held in downtown Pittsburgh a few days before our vintage races in Schenley Park. Come meet the racers, see their cars up close and mingle with the fast crowd! The Tune-Up is moving across the river to Atria’s at PNC Park! The car show will start on Federal Street and run all the way across the Roberto Clemente (Sixth Street) Bridge with a tremendous view of the point. This promises to be a great night in Pittsburgh! Tune-Up Attendee (Available at the Door). These tickets are $40 for each person and can only be purchased at the door .